Javier Suso CEO javier.suso@grey.es www.Grey.es The recovery of the ..
Joan Ramon Vilamitjana CEO Hill + Knowlton JoanRamon.Vilamitjana@hkstrategies.com http:/..
Jorge Folch Managing Director Jorge.Folch@kantarworldpanel.com www.kantarworldpanel.es &..
Jose María Piera Executive Vice-President SCPF JMPiera@scpf.com www.scpf.com &..
Hugo Llebrés CEO MEC Hugo.Llebres@mecglobal.com www.mecglobal.es MEC Gl..
Clara Ureña Client Manager (Media & Digital) Clara.Urena@kantarmillwardbrown.com ..
Begoña de la Sota CEO MediaCom España Begona.delasota@Mediacom.com www.med..
Alberto Relaño Innovation & Digital Director Alberto.Relano@tnsglobal.com www.tn..
Jon Artolozaga Director General Intelligence GroupM Jon.Artolozaga@groupm.com www.groupm..
Adrián Mediavilla Head of Planning Señora Rushmore Adrian.Mediavilla@srarushm..
Elvira Arzubialde Saenz-Badillos Spain Country Manager WPP Health & Wellness Elvira.Arz..
Jesús Valderrábano CEO Ogilvy & Mather Spain Jesus.Valderrabano@ogilvy.co..
Juan Pablo Carrero Director of Strategic Planning Wunderman JuanPablo.Carrero@wunderma..
Almudena Alonso Managing Director Cohn & Wolfe Almudena.Alonso@cohnwolfe.com www.coh..
Francisco López COO Burson Marsteller Francisco.Lopez@bm.com ..
Mónica González Ortín Country Manager AxiCom Monica.Gonzalez@axicom.co..
César Montes Global Chief Intelligence Officer & Chief Strategy Officer EMEA Geomet..
Top of the food chain How Campofrio keeps tapas fresh Jaime Lobera, Chief Market..
Banking on change BBVA helping consumers seize opportunities Carlos P&eacu..
Life in the fast lane How SEAT is meeting the fresh demands of young consumers .. 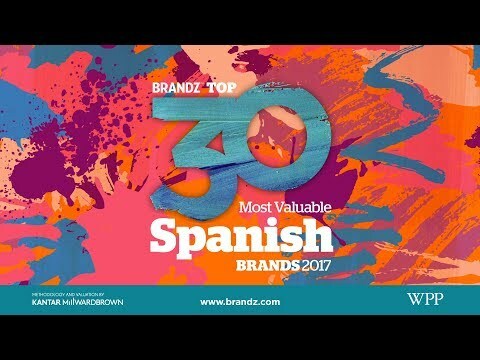 Enabling connections close to home Interview with Gemma Escribano, CMO, Wallapop &nb..
Raising a glass Keeping the fizz in century-old business C&eacut..
BANKINTER Company: Bankinter SABrand Value: US$209 millionHeadquarter city: MadridSector: Banks..
SEATCompany: Volkswagen AGBrand value: US$242 millionHeadquarter city: Martorell (Barcelona)Industry..
CUATRO Company: Mediaset España Comunicacion SABrand Value: US$296 millionHeadquarter ci..
IBERIA Company: International Consolidated Airlines Group SABrand Value: US$362 millionHeadquar..
ANTENA 3Company: Atresmedia Corp de Medios de Comunicacion SABrand Value: US$386 millionHeadquarter ..
JAZZTEL Company: Orange SABrand Value: US$430 millionHeadquarter city: MadridSector: Telecommun..
Banco Sabadell Company: Banco de Sabadell SABrand Value: US$474 millionHeadquarter city:..
TELE5Company: Mediaset Espana Comunicacion SABrand Value: US$607 millionHeadquarter city: MadridSect..
CRUZCAMPOCompany: Heineken NV[DLT(1] [JB2] Brand Value: US$659 millionHeadquarter city: SevilleSecto..
MAHOU SAN MIGUEL Company: Mahou San MiguelBrand Value: US$685 millionHeadquarter city: MadridSector:..
CATALANA OCCIDENTECompany: Grupo Catalana Occidente SABrand Value: US$756 millionHeadquarter city: S..
DIA Company: Distribuidora Internacional de Alimentacion SABrand Value: US$763 millionHea..
MapfreCompany: Mapfre SABrand Value: US$868 millionHeadquarter city: Majadahonda, MadridSector: Insu..
Bankia Company: Bankia SABrand Value: US$1,072 millionHeadquarter city: Valencia (operat..
MANGO Company: Punta Na Holding SABrand Value: US$1,190 millionHeadquarter city: Palau de Plega..
CaixaBank Company: CaixaBank SABrand Value: US$1,220 millionHeadquarter city: BarcelonaSector: ..
El Corte Ingles: Department store promises satisfaction on and off-line Company: El Corte Ingl&.. Pull & Bear: Californian look sets tone for clothing store chainCompany: Industria de Diseno Tex..
Bershka: Fresh releases help young fashion fans keep up to date Company: Industria de Diseno Te..
MERCADONA: Customer’s the boss at leading supermarket chainCompany: MercadonaBrand Value: US$1..
Stradivarius : Expansion into menswear for trendy fashion name Company: Industria de Dise..
REPSOL: Motorsports link helps brand understand the future Company: Repsol SABrand Value:..
Massimo Dutti: Elegant collections cater to young professionals Company: Industria de Diseno Te..
Gas Natural Fenosa: Film links highlight innovation and sustainabilityCompany: Gas Natural SDG..
IBERDROLA: Clean, green power at heart of advertising Company: Iberdrola SABrand Value: US$5,32..
BBVA: Creating opportunities through focus on digital Company: Banco Bilbao Vizcaya Argen..
MOVISTAR: Mobile market leader expands into TV, musicCompany: Telefónica SABrand value:..
BANCO SANTANDER: Heritage bank becomes key international player Company: Banco Santander SABran..
ZARA: First name in fast fashion becomes global powerhouse Company: Industria de Diseno Textil ..
Vicente Grau Commercial Director – WPP Spain Vicente.Grau@wpp.com www.wpp.com &nbs..
ENDESA: Energy giant promotes flexibility for customersCompany: Endesa SABrand Value: US$4,952 milli..